The Atlantis Resort Pattaya is the first development project in pattaya to truly deliver it's resort facilities. Designed by Thailand’s leading landscapers who has created a unique environment. Residence can now enjoy a themed water park on a large 11 Rai plot of land. 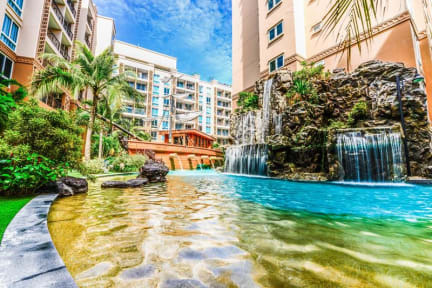 It's exotic tropical garden surrounds the swimming pool, natural waterfalls, sloped beach style edges, wooden foot bridges and an old style lanterns light up in the evenings that creates a charming atmosphere. Adults can enjoy the luxury of Jacuzzis, fully equipped gym and children water play ground and slides can be enjoyed by children. - If cancelled or modified up to 14 days before date of arrival, 100 percent of the first night will be charged.